It feels rather counter intuitive to have chosen this as the recipe inspired by Rosie Birkett. Rosie is a gorgeous, petite sort of woman who makes the most beautiful looking food. But I found her choice of Desert Island Dishes to be wonderfully broad and really reflective of someone who is passionate about food. This means she is equally as happy with a bacon sandwich as she is with the best spaghetti vongole Venice has to offer. All food has a place and it can mean different things to different people and at different times. A Michelin starred meal is an experience in and of itself that surpasses just the food. It is a spectacle, a theatrical event that is choreographed to perfection. It perhaps marks a special occasion, a celebration or perhaps simply the luxury of being able to flex the plastic in your wallet. Take the chip butty on the other side of the spectrum. A little less fancy one may argue but theatrical in a different sense. The trip to the chippie down the road whilst mum warms the plates in anticipation and lovingly spreads butter on thick white sliced bread in preparation for the hot salty chips. Ketchup is passed around, as chips are bundled onto bread and eyes light up as the butter begins to melt from the hot chips. Silence as hungry mouths chomp on chip filled sandwiches, a humble warm up to the battered fish. The joyous, unadulterated pleasure of carb on carb. Food doesn’t have to be fancy to claim top spot in your memories of great occasions. And that brings me nicely on to today’s bacon sandwich. 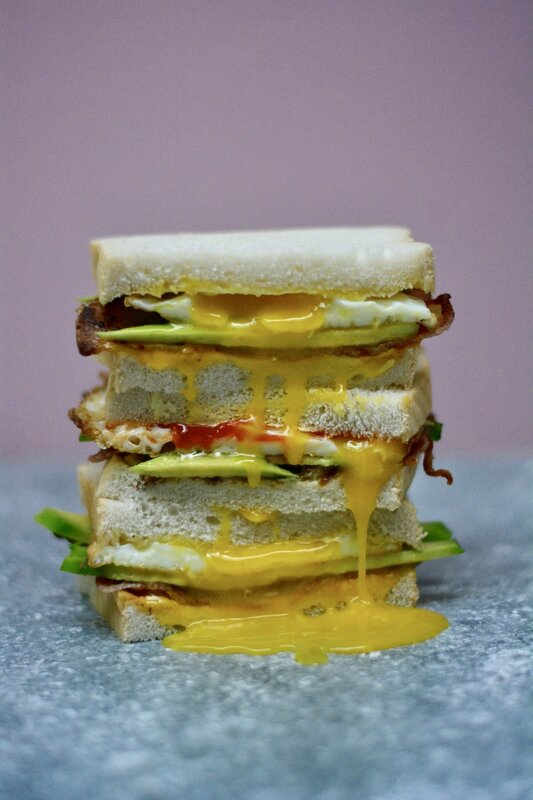 The bacon sandwich is the hangover’s best friend. It’s simple but effective. It requires zero culinary skill and yet, making someone a bacon sandwich is a sign of real care and love. A bacon sandwich says, feel better soon, it denotes the start of the weekend or exciting adventures to come. It’s not your every day breakfast. No, it’s a special occasion breakfast. I remember the first time I had a bacon sandwich. I was about 8 and spending the Summer in Salcombe, Devon as we did every year. There was a greasy spoon down by the harbour where tables were laid out in the car park and crowds queued round the block. The tea was highly sugared, there was brown sauce and ketchup on the table and the seagulls eyed us hopefully. I ordered a bacon and egg sandwich. Imagine, an egg in a sandwich? In the eyes of an 8 year old this was next level stuff. Biting into the hot bacon, sandwiched in thick white bjttered bread was nothing short of unbridled joy. The yolk from the egg burst as I bit in, and fused with the butter and bacon fat. Utterly glorious. Messy fingers, for once my chatter silenced. There would be no joy this time for the seagulls. University years saw the bacon sarnie elevated to poll position for curing a hangover. But as I’ve grown older and the hangovers have become less frequent, I still find myself craving the joy and comfort in equal measure that the bacon sarnie can bring. I love the idea Rosie has to grill the bacon and then mop up the bacon fat with a piece of the bread. That sounds so naughty, it has to be nice. And so it remains to this day that the bacon sandwich has never let me down. It’s always as delicious as I expect it to be. Sometimes I add egg and sometimes I don’t. Sometimes I add avocado and sometimes I don’t. I occasionally opt for a brown bread, but most often it’s white. I always add butter and I always add ketchup, those are non-negotiable. I personally like to fry my bacon as I find it results in crispier bacon and more to the point...I find it much a much faster method, which let's be honest is often important when it comes to bacon sandwiches. Try not to move the bacon around too much and allow it to get gorgeous and crispy. Once cooked, removed from the pan and place straight onto the buttered white bread. Fry the eggs in the same pan in the bacon fat..I mean, why wouldn't you? Top with creamy slices of avocado. Pop a buttered slice of bread on the top, press down to encourage the yolk to burst and slice in half.